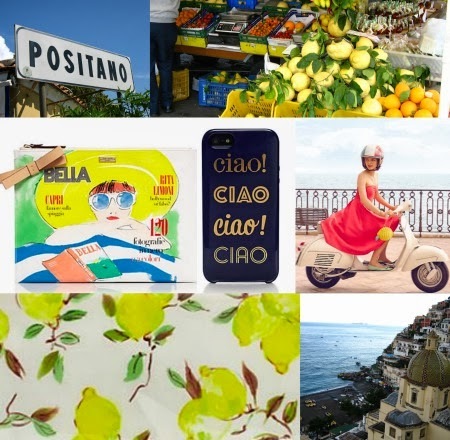 I am loving Kate Spade's inspiration and design for some of their new line based on the Amalfi Coast of Italy, specifically Capri. I loved visiting that area of the country and am lucky enough to have been there, twice! Positano is my favorite of those Mediterranean seaside cities, so I put together this inspiration collage with some of my photos. Check out Kate Spade's new arrivals for much more. This makes me so excited for our trip! We leave for Positano and Capri on Thursday! Ahh it's like spring in Tuscany! How lovely! The lemon print is so fresh and summery. We enjoyed a holiday in this part of Italy and I loved Capri in particular.